Turtle Bay Beach Club is situated on 200 metres of beach on the edge of the internationally acclaimed Watamu National Marine Park, one of the best in Kenya. The hotel buildings are set in 10 acres of tropically landscaped gardens with 145 rooms, 4 restaurants, 3 bars, entertainment lounge and swimming pool, and as such makes up one of the most extensive all-inclusive properties in Kenya. All rooms are en-suite with fans and air-conditioning. Stays include all meals, domestic drinks, sparkling wine, day and night entertainment and a supervised Kids Club, which is open daily for children between 4-12 years of age and offers games, swimming competitions, arts and crafts, field trips, cooking lessons, videos and much more. There is a range of activities available for guests at the club including diving, snorkelling, windsurfing, fishing, horse riding, tennis, cycling, cultural and sightseeing trips. The hotel is also perfectly positioned for exploring Watamu Marine Park and Mida Creek. Turtle Bay has excellent eco credentials and is actively involved in community and conservation projects including helping local schools and orphanages. The resort is also involved in Watamu Turtle Watch, a community-based project dedicated to protecting sea turtles and the marine environment. Open: Turtle Bay Beach Club is open all year. Location: Turtle Bay Beach Club is on the coast near Watamu Marine Park. It occupies 200 metres of beachfront and has 10 acres of grounds. Malindi airport is 25kms away and the club is about a 2 hour drive from Mombasa airport (110kms). Rooms: There are 145 rooms in 4 categories. All are air conditioned and have mosquito nets, tea and coffee makers, safe and en-suite bathrooms. Super Club rooms (89) have double and single beds and balconies. Some rooms are interconnecting. Lamu rooms (40) have time or double beds and overlook the beach or garden. Ocean Front rooms (14) can accommodate up to 3 adults or 2 adults and 2 children. The Sea View suites (2) have a lounge and fridge and accommodate 2 adults. Activities: The club offers a range of watersports and cruises. Diving is excellent. There are 20 prime sites and there is one of the richest varieties of fish and corals in the world. You can go snorkelling with an experienced zoologist to see the coral gardens, take a treetop canopy walk in the mangroves, visit the ruins of Gede town and the nearby Kipepeo Butterfly Project. 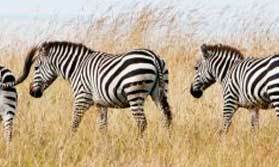 Other excursions include a canyon tour and trips to Mombasa and Malindi. Boat rides to look for dolphins are popular. You can go bird watching with a local naturalist guide. Tennis, soccer, volleyball and table tennis are available here. In the evenings there are African dance displays, acrobats and quiz nights. Facilities: There is a large swimming pool and a children’s paddling pool. Beach towels are provided. You can enjoy a soak in the Jacuzzi and take a stroll around the gardens. The club has 4 restaurants. The main restaurant is open for breakfast, lunch and dinner which are served buffet style. There is also a pizza restaurant, a snack bar by the pool and the Blue Turtle Restaurant on the beach for a la carte dining. There are 3 bars and an entertainment lounge. You can browse for souvenirs in the boutique. The reception is open 24 hours a day. There is a currency exchange. Children: Children of all ages are welcome. The Kid’s Club arranges special activities for children aged between 4 and 12. Communication: There is a free email service and there is internet access, to be paid for locally. 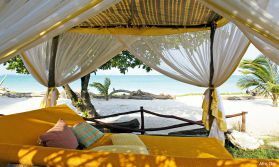 Enjoy rest and relaxation on the beautiful Kenyan coast.